Product LFKLKR008 is sold in quantities of 1. This means you are purchasing . Please Check the Shopping Cart. Product LFLEBAA is sold in quantities of 1. This means you are purchasing . Please Check the Shopping Cart. Product LFTLO020 is sold in quantities of 1. This means you are purchasing . Please Check the Shopping Cart. TLO Fuses are medium time-delay Edison-base fuses designed for general-purpose branch-circuit protection. See TOO and SOO fuses for motor protection. Use for replacement purposes only. Applications The National Electric Code now permits Edison-base fuses to be used only for replacements in existing installations, and then, only when there is no evidence of overfusing or tampering. All new Edison-based fuseholders must have Type S fuse adapters installed before they are placed in service. 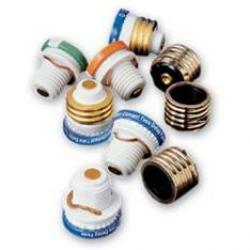 Designed to prevent installation of wrong size fuses, Type S Adapters (SAO series) screw into Edison-base fuseholders so they may accept Type S fuses. Once installed the adapters cannot be removed. To prevent shunting of open fuses or overfusing, and to reduce nuisance fuse opening, it is recommended that SAO adapters with properly rated SLO or SOO series fuses be installed in all Edison-base fuseholders. Product LFLRU213R is sold in quantities of 1. This means you are purchasing . Please Check the Shopping Cart. Product LFLRU263R is sold in quantities of 1. This means you are purchasing . Please Check the Shopping Cart. Product LFFLNR090ID is sold in quantities of 1. This means you are purchasing . Please Check the Shopping Cart. Product LFFLNR100ID is sold in quantities of 1. This means you are purchasing . Please Check the Shopping Cart. Product LFFLNR125ID is sold in quantities of 1. This means you are purchasing . Please Check the Shopping Cart. Product LFFLNR200ID is sold in quantities of 1. This means you are purchasing . Please Check the Shopping Cart. Product LFFLNR600ID is sold in quantities of 1. This means you are purchasing . Please Check the Shopping Cart. Product LFFLSR008ID is sold in quantities of 1. This means you are purchasing . Please Check the Shopping Cart. Product LFFLSR010ID is sold in quantities of 1. This means you are purchasing . Please Check the Shopping Cart. Product LFFLSR020ID is sold in quantities of 1. This means you are purchasing . Please Check the Shopping Cart. Product LFFLSR030ID is sold in quantities of 1. This means you are purchasing . Please Check the Shopping Cart. Product LFFLSR040ID is sold in quantities of 1. This means you are purchasing . Please Check the Shopping Cart. Product LFFLSR050ID is sold in quantities of 1. This means you are purchasing . Please Check the Shopping Cart. Product LFFLSR060ID is sold in quantities of 1. This means you are purchasing . Please Check the Shopping Cart. Product LFFLSR080ID is sold in quantities of 1. This means you are purchasing . Please Check the Shopping Cart. Product LFFLSR090ID is sold in quantities of 1. This means you are purchasing . Please Check the Shopping Cart. Product LFFLSR100ID is sold in quantities of 1. This means you are purchasing . Please Check the Shopping Cart. Product LFFLSR125ID is sold in quantities of 1. This means you are purchasing . Please Check the Shopping Cart. Product LFFLSR150ID is sold in quantities of 1. This means you are purchasing . Please Check the Shopping Cart. Product LFFLSR200ID is sold in quantities of 1. This means you are purchasing . Please Check the Shopping Cart.